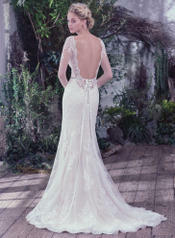 This classic sheath wedding dress features embellished illusion lace over jersey and atop a feminine sweetheart neckline. Long sleeves with hand-placed lace appliqu�s (Roberta) or a sleeveless neckline (Roberta Marie, not pictured) offer the perfect variety to accommodate your style. Complete with a dramatic illusion scooped back and scalloped hemline. Finished with covered buttons over zipper closure. Detachable beaded belt sold separately.